A regional publisher is to close one of its free newspaper titles – saying its local market had become “increasingly overcrowded” since the launch of a council newsletter in the area. 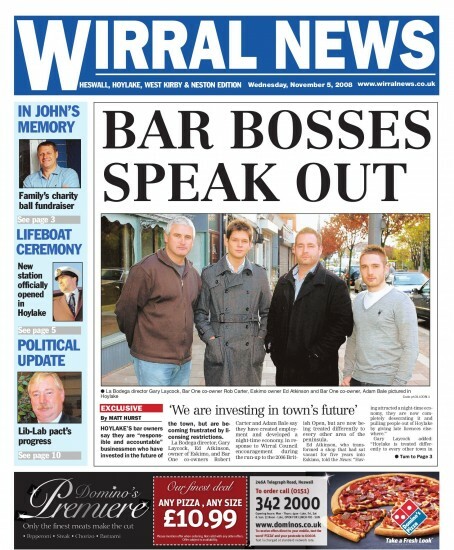 Trinity Mirror says it will shut the bi-weekly Wirral News next month, saying there is “no longer a viable future” for free print products in the area. As well as Newsquest-owned weekly the Wirral Globe, the peninsula is also served by Wirral Council’s monthly newsletter Wirral View. The newsletter was launched in October in defiance of the Department for Communities and Local Government’s publicity code, which states council newsletters should not be published more than quarterly. No editorial jobs are being lost as a consequence of the closure, although it is envisaged one advertising post will go. Trinity Mirror said in a statement: “The Wirral marketplace has become increasingly crowded with free print products with now even Wirral Borough Council producing a monthly free print publication themselves. “We believe that there is no longer a viable, scalable or long-term future for free/giveaway print products within the Wirral marketplace and have therefore, decided to bring forward our digital plans and ambitions which will benefit readers and advertisers alike. “We have made a number of changes to the Wirral News operating model to extend its life whilst we concentrated our efforts and resources in developing and growing a digital audience of unrivalled scale and quality, targets which we continue to surpass. Another giveaway goes – so what. More importantly, why wasn’t Wirral Council challenged for defying the Department for Communities and Local Government’s publicity code? I have to say, as bitter a pill as it may be to swallow, this is the way to go with groups looking seriously at under performing or unprofitable titles and taking whatever action is necessary to reduce losses enabling them to refocus on the areas which are more viable. Too many publishers allow titles to limp along incurring costs and taking up resources which become a serious drain on the business so this has to be a positive move. It’s also good to hear of no editorial job losses as a result . TM would be conducting a commercial audit which has to be applauded and hopefully other groups might also follow suit avd review their entire commercial operations effectiveness too. We all know and can see the industry is seriously weighed down by too much deadwood and too many paper shuffling,report writing under performing individuals, multi levels of ad managers and those with a fancy but meaningless title who are highly paid but produce little or nothing in return, many of them in my experience,critical of their companies and its policies and just hanging on in for a pay off. Free paper dies. No loss.